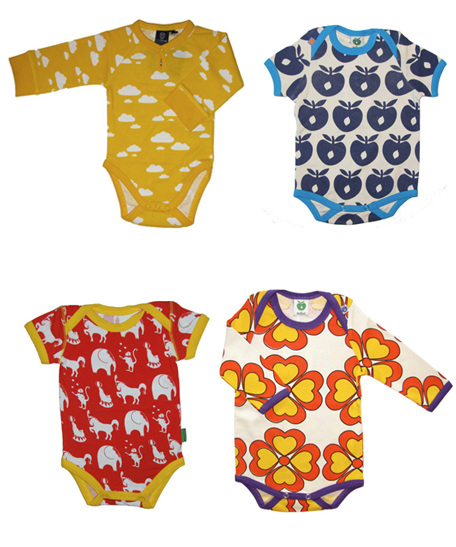 These Scandinavian inspired prints are so cute and they make the best baby presents. This next kid is going to get 95% hand-me-downs so I’ve been on the lookout for some special pieces I can get just for him. Holy smokes. My biological clock just became a time bomb. Those are way too cute. Very cute and happy prints! At $29 for a onesie that would definitely have to be a "special" piece in our house! Gorgeous fabrics though. These are adorable! Don't forget to check out the original ones, though. http://www.polarnopyretusa.com We love all things Swedish! so adorable! wish i had a kid so i could dress him/her in these! this is so cute. are you SO excited to welcome your new baby? I have a 2 month old. it's crazy how they grow oput of their clothes so fast. What happy little onesies! I love finding baby clothes that don't look like every other baby outfit. These sure fit the bill. Thanks for the link. You find/make/do the most most wonderful things! And the itikid bonus is that…they have adult sizes too! So nice! I bought Polarn O. Pyret's winter jacket earlier. They are running a deal with the Swedish School for Children in DC now, which is open to anyone. A $40 gift certificate for $20. The school's website has info how to get it online: http://www.svenskaskolanwashingtondc.org/en.